Electrical consumables are not only for home and office use, they are also travelling essentials that you cannot do without. Offering an assortment of electrical consumables, Soundteoh Electronic has everything to satisfy your home and lifestyle needs. From travel adaptors to extension cables, Soundteoh has got every single electrical consumable you can think of. Here is a list of Soundteoh Electronic products we have shortlisted to cater to your daily home, office and travel use. In this day and age, we are heavily dependent on a suite of gadgets to power our lifestyles. And being able to only charge one device at a time is not going to cut it. The Soundteoh Universal Adaptor with Dual USB Charger WP-131U allows you to charge 3 devices simultaneously with one standard plug-in device and two USB outlets. The dual USB ports allows charging of up to 3100mA. 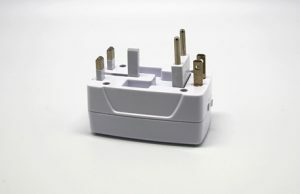 It includes four integrated plugs – compatible with US, EU, AU and UK standard outlets – which works virtually anywhere in the world. 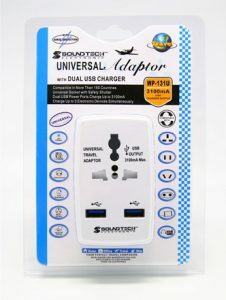 This adaptor is not only great for home and office use, it is also a must-bring essential on your travels. With its collapsible pins and compact design, you can now travel light and save space. The adaptor has also built-in safety shutters to safeguard users, especially children, from the direct touch of the live parts on the socket outlet. This prevents any occurrence of short circuit or shock. Additionally, it is protected against fire hazards such as overheating or melting as it is made of highly heat resistant material. This ensures that it is safe and reliable to use. The battery-operated LED Push Light PL-8303 functions as a nightlight or an additional light source. This highly versatile light brings a comforting glow to any space. It keeps your room softly lit whilst not being as intense as the common overhead lighting. It is powered by a durable and long-lasting LED source. Being eco-friendly, it is ensured to be energy saving with low power consumption. This product would be suitable for the little ones who are afraid of the dark or for the older folks who are often awake in the middle of the night to use the washroom. 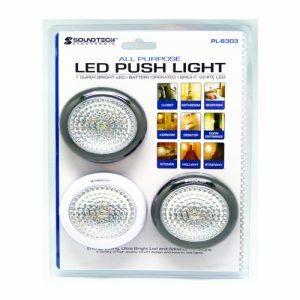 The LED Push Light also provides functional use for your closet or dimly lit places such as the stairway. The application of this product is also fuss-free and easy – simply peel, stick and mount it up on any smooth surface. Also, being portable and lightweight, you can mount it anywhere possible. Ever faced this problem where your power outlet is out of your reach? Or when your charging cable is too short? This product will solve these problems for you. Designed with a 3-metre-long cable, the 4-way Extension with USB PS-442U is ideal for use when mounted power outlets are too far away from your device. It also includes 4 power socket outlets for standard plug-in appliances with 2 additional USB outlets with up to 4200mA of output. This means that you can charge up to 6 devices at a time! Thus, this would be perfect for use at communal office desks and co-working spaces. With built-in safety shutters and USB self-overheating protection, you need not worry about surges or overloading. 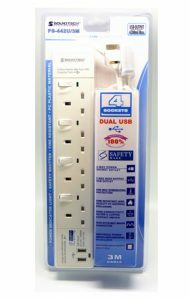 The extension power strip is also affixed with the Safety Mark certification. This ensures that products that are certified are designed and produced in accordance to established safety requirements. Have you ever left the power outlet switched on with your appliances running simply because you forgot to turn it off? It may happen either by accident or out of habit. More often than not, we overlook how prevalent such safety hazards are in our homes and offices. 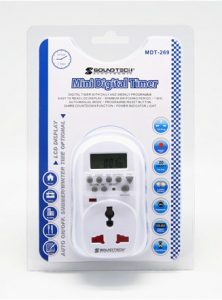 With the Digital Timer MDT-269, you can now control how long your electrical appliances run for. This means that you set your fans and lights to automatically turn off at a certain time. It is also useful to control appliances that only needs to be turned on at fixed timings such as sprinklers and water fountains. This will not only reduce the risk of safety hazards, it also allows you to save on energy consumption. The digital timer comes with a 1.2V built-in rechargeable battery for power reserve. You can set your timer for a minimum of 1 minute and program up to 20 different on/off settings per day. Its functionality and easy usage is ideal for efficient home control without the need for complicated systems. Before Hean Lee Radio Service Pte Ltd became one of the leading pioneers in the electrical consumables market, it started as a humble family-owned business by Mr Lee Hian Cheong back in 1957. He was first involved in trading of electrical components and parts. Soon after, he realised that the trading is not sustainable in the long-run. Mr Lee then ventured into the importation/exportation of goods from overseas and started selling wholesale to retailers. Under Mr Lee’s guidance and leadership, Hean Lee has seen accelerated growth over the years. The company has progressed tremendously with the unwavering support of their loyal customers. Since then, Hean Lee has build a strong and identifiable brand, Soundteoh Electronic, specialising in electronics and electrical household products. These products include power adaptors as well as digital doorbells. Soundteoh Electronic products are not only widely available in the local market, they also have worldwide presence in countries like Malaysia, Indonesia, Brunei. To further amplify their reach, their sales network even extends to countries outside the region such as Malawi and Cyprus. Since its humble beginnings, Hean Lee has been committed to providing their consumers with quality yet affordable products. They also aim to meet their consumers’ ever-changing needs with competitive pricing, efficient deliveries and attentive customer support. It is no doubt that the Soundteoh Electronic brand houses an array of electronics and electrical consumables. But did you know that they have a dedicated Research and Development (R&D) team to innovate and create new products? Through this initiative, Hean Lee Radio Service Pte Ltd is able to gear their products towards fulfilling consumers’ existing unmet needs. Creating new products that customers would need but not yet existent in the market allows them to satisfy their customers better. By constantly innovating, Hean Lee is able to bring the business to greater heights. The innovation process begins by designing and drafting out the prototype of the new products. The designs are then sent to their partner, a China-based factory, whom they keep an open and transparent relationship with. It is imperative for the both of them work together closely to develop and create new products that would meet the needs of end users. These innovations can revolve around improving and adding new features to existing products or working on completely new creations. Hean Lee draws the inspiration behind their innovations from almost everywhere – from their own existing products to those presented at trade shows. Their team first understands their consumer base and thereon, uncovers unmet customer needs. Identifying gaps in the market serves as opportunities for them to better their products and address their customer’s needs. Hean Lee also gets its inspiration from its current range of products by discovering ways to improve on them. Additionally, they are actively present at industry trade shows where they observe various products in the market and derive inspiration for future innovations. With their dedicated R&D team focusing on the innovation of new products, Hean Lee is able to differentiate their products from the rest, creating a competitive edge for their brand. You can find and purchase all aforementioned products and many others on Eezee’s platform. Eezee is Singapore’s first B2B online marketplace for buyers and sellers of industrial hardware and supplies. We have written this article solely to highlight our merchant partner, Hean Lee and their brand of products.